One of my favorite aspects about living on a farm is the opportunity to share its magic with visitors, especially children. Over the past three years I have had the honor of hosting all sorts of folks, yet school groups remain a constant source of inspiration and motivation for designing new programs and building the infrastructure to support them. My humble farm measures a little over 3 acres; within those boundaries lies an extraordinary amount of hands-on experiences. First and foremost, everyone's favorite (and mine too) is hanging out with the resident critters. Most of the herd is standoffish unless there is food involved. Then we have Mrs. Brown. Piece by piece, I am tackling projects around the farm in order to create a layout that is most conducive to welcoming guests by offering a safe learning environment for all ages. One of the best parts of the farm isn't visible from the road or the back yard. Tucked away on the back corner of the farm, a grove of Hemlocks + Pine Trees is surrounded by two creeks that wind along the edge of the property, and eventually meet to form a tiny peninsula. A footpath has been carved along this hidden gem of woodland; all farm tour attendees are invited to enjoy a stroll. Along the path guests will find a stack of White Oak Logs that have been inoculated with Shiitake spores. Depending on the weather there could be a flush of edible mushrooms. This small patch of wooded area offers a multitude of learning opportunities which we have just begun to explore, although Woodland Weaving has quickly become a favorite theme. 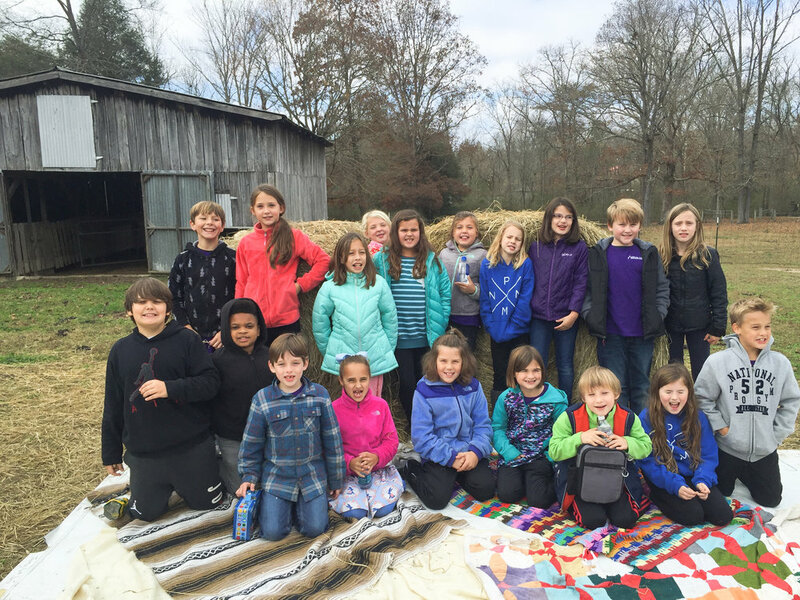 Last Autumn a group of roughly 100 3rd graders had the opportunity to take a walk in the woods and contribute to a community weaving project using scrap fabric + natural elements. This unique collaborative project has inspired the practice of woodland weaving to be included in more workshops and gatherings here at the farm. 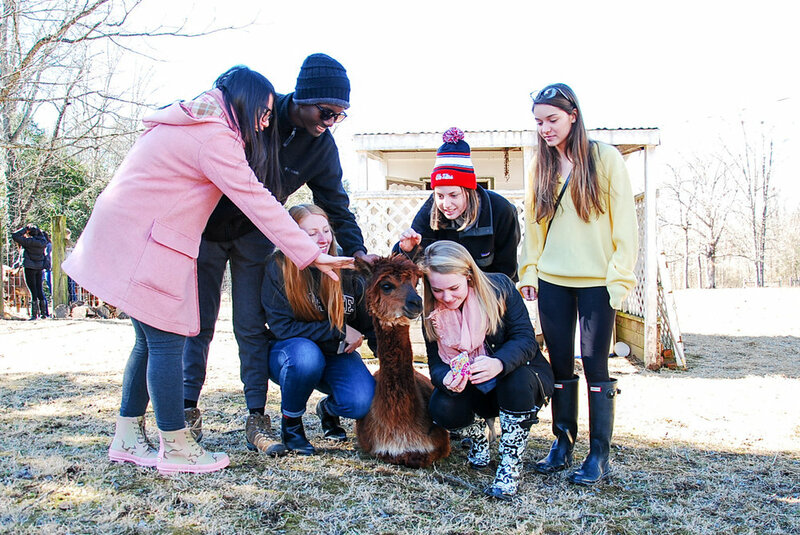 Every spring the resident alpacas receive their annual haircuts, yielding several different qualities of fiber with a variety of end uses. In order to make the most of each year's harvest, I tend to stick to a system that utilizes all the fiber from my humble herd of 8 with minimal waste. The first cuts / prime fiber is carded + spun into yarn, that will be woven into scarves and knit / crocheted into hats. The seconds are combined with other fiber (usually some type of wool) and are spun / dyed to be used as accents in scarves, hats, and woven tapestries. 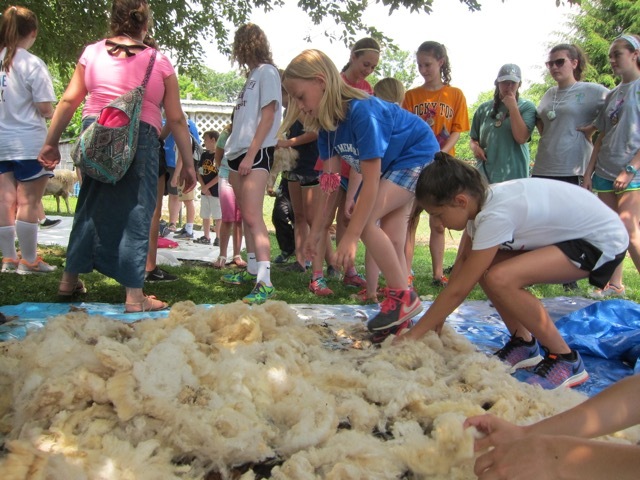 The thirds are reserved for felting projects + farm tours. The idea of utilizing the thirds was gleaned from a conversation I had while visiting with my alpaca gurus, Bill + Sherry Watkins. Sherry told me to sandwich the fiber in between two layers of tarps. 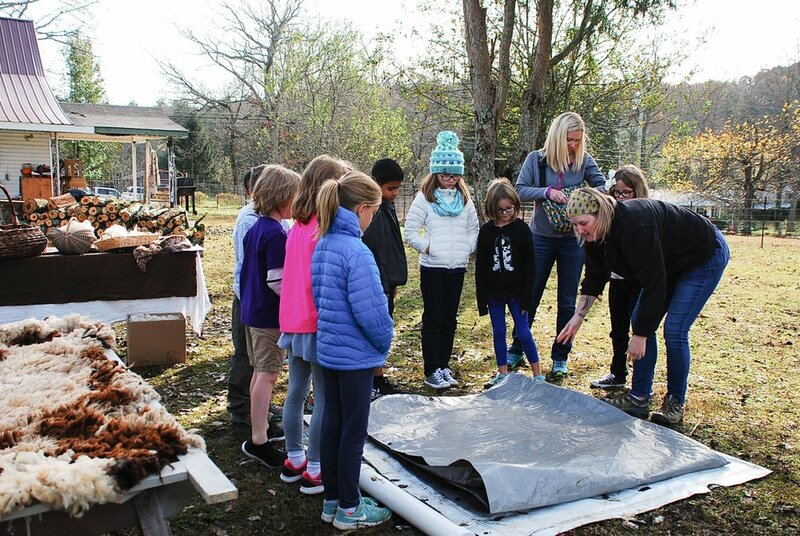 After spraying the fiber with soapy water I was to let the kids burn off some energy by jumping on the tarp, thus turning the fiber below their feet into felt. After several rounds of these felting episodes, we have managed to put together a series of art pieces created from the collaborative effort of a bunch of stomping people + a few repurposed resources. These felted panels were created using a combination of alpaca 3rds + various colors of naturally-dyed wool from my neighbor's sheep. Once the student masterpieces had dried, I needle felted them together onto cotton twill fabric, then stapled the fabric around a couple pieces of recycled plywood. These types of collaborative projects are always evolving as various materials become available. I just so happened to score the plywood from my neighbor who was tearing down an old tree house and had saved the flooring. I am grateful for this extremely fruitful plot of land, which has allowed me to host groups of all types. If you are interested in visiting the farm, please feel free to get in touch and let's plan an experience catered to your group's interests.